Kris Metzger – .a former U.S. Tumbling Association (USTA) National Coach of the Year – is the founder of Kris' Power Tumbling with a legacy that started with a little girl's dream. It's a dream realized and a dream that continues to live on through the love of teaching tumbling and other complimentary skills to her students. "It was always my dream to own my own studio, but we were really poor," said Kris Metzger, the founder of Kris' Power Tumbling and Dance. "I was always doing cart wheels down the hall. I used to flip around everywhere we went, the theater, at school, out in the yard, teaching myself. My mom worked three jobs to support me in tumbling. I owe it all to her." Kris took tumbling since she was 6 years old at Jansen's Gym in Effingham. 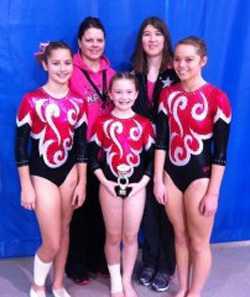 "I did everything, tumbling, gymnastics, and dance, and competed in power tumbling," Metzger said. Metzger went on to be a cheerleader in Effingham Junior High and Effingham High School. She taught for Jansen's Gym when she was still in high school. All along, she still dreamed of having her own gym one day. Metzger opened her first gym in Cowden in 1995, while still a full-time student at Eastern Illinois University. "People were driving from Shelbyville to Cowden for classes, so I opened a second location in Shelbyville in 1997," Metzger said. Metzger was born in Flora, so when she opened her third studio in 1999, it was in Flora. After a few years she sold Flora and consolidated Cowden and Shelbyville and moved to her present location. Kris' Power Tumbling and Dance moved to their present studio just east of Shelbyville on Route 16. The move was to a 16,000 square foot building, from a building across town that was maybe half that size. "At the old building, the kids had to jump between the rafters," Kris said. "When we opened our first location, we had about 40 students. We expanded to about 75 students, then 125, then in 2002 we went to about 200 at the new center." There had been two or three other studios in the past in Shelbyville. So why does Kris' studio have staying power? Maybe it's because she's living out her dream. "I think it's my passion and my love for what I do," Metzger said. "It takes more than just opening your door and saying, I'll start a gym. It's a business, but you have to run it like a family. Our gym is family-oriented, like one big family. " "You have to be great with the kids," Kris said. "That's a benefit. We have all kinds of kids, different ages, and its something I love to do. I have a degree in Sociology, but I'm happy with what I'm doing. I can't really see myself doing anything else." The dream has not been without personal challenges. In 1997, Kris' 3 month-old daughter, Riley Pullen, passed away. As a positive response, Kris established a memorial scholarship in her name. The scholarship is available to an advanced student and can be used for lessons or for college. Recipients must apply and do not have to be from Kris' studio. Many of the advanced students have followed Kris' dream, teaching while still in school and even competing on the National USTA Team. There are presently about 10 staff members at the gym, but a couple of key individuals helped Kris lay the foundation during the early years of her dream becoming a reality.."